Salmon Falls Mills, consists of two large mill buildings located on the banks of the Salmon Falls River in Rollinsford, NH. Over over a hundred artists and businesses work in the mills. In addition to the mill parking lots, street parking is readily available. The charm and character of the mills have also drawn local businesses and the Rollinsford Public Library. 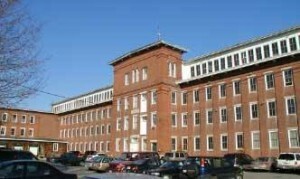 Commercial office space is primarily located in the lower mill. Both office and artists studios may be built out to the tenants needs. Tenants are also allowed to customize spaces as they wish including painting, adding ceiling fans, installing A/C, or sinks. As a result, each space is the mill has a unique look and custom amenities.